“Easter Island” is how the tiny volcanic thumbprint of Earth’s mantle in the middle of the south Pacific is known to most of the world. It is a name given to the island by Dutch explorers to commemorate the day they found the land of stoic stone statues. 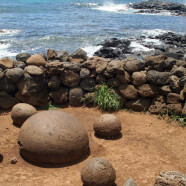 The name used by the island’s inhabitants and each visitor who knows better however, is Rapa Nui. Oral history of the of the island hints to the original name even before “Rapa Nui” as being “Te Pito Te Henua” or “The Navel of the World.” Looking out into the ocean from the top of any of the volcanoes on this tiny isolated island, the thought that you are situated warmly on the tip of Earth’s belly is blithesome and comforting. This round center stone at Te Pito Kura is said to possess large amounts of mana. Because of the high iron content, it causes compasses to misbehave and heats up dramatically in the sun. The airport is located in the island’s single town called Hanga Roa (translated means “wide bay.”) Hanga Roa is, for the most part, one main street (Av Atamu Tekena) which for the span of about two blocks holds the bulk of the town’s restaurants, markets, and offices. Just off the main street at one end is the post office, church, graveyard, and couple of bank machines. You can walk leisurely from one end of Av. Atamu Tekena to the other during the day and miss nearly all of the shops and buildings on that are sunken into to trees. All the food and materials on the island are shipped by plane from Santiago, so everything is expensive, even for the locals. Prices be damned, how could I resist drinking a pap? There are some budget finds to be had. Every day we were there we made it to a small bakery that was undecorated except for a chalkboard that noted the current 3-10 available choices. Large batches of empanadas are made in the morning, and if you get there early enough you can get the one of your choice. For the rest of the day until they are gone your choices are limited to what is remaining of the greasy paper-wrapped pockets that are kept warm by the heat of each other in a series of coolers. They are almost as good later in the day, and easily the cheapest meal we found. The pescado (fish) empanada was by far my favorite; filled with white fish, green onions, and sopping with threateningly molten cheese. We sat curbside in the mornings while a once-white dog who was tormented by fleas sat at our feet and soberly accepted our company. Spanish banter encircled us musically, and sank into the ambiance of rising heat and dust. 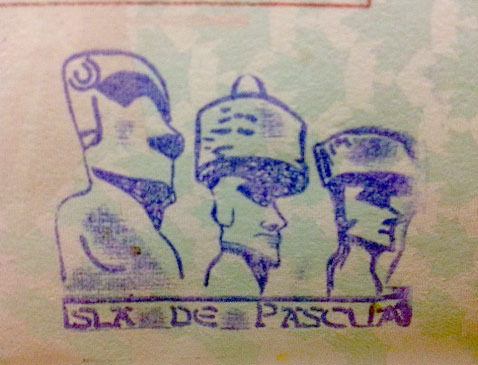 You can get a special Easter Island passport stamp at the post office. The population of the island is just over 5700 people, so the residents all know each other to some degree, and violent crime is practically nonexistent. With the only animal that can by any extent be called a predator being the few house cats, it is the kind of place you can wander aimlessly after dark with the milky way swirling clearly above you beyond dim and sparse street lights, hazed only by the better part of a bottle of wine. The most dangerous of all things to encounter is the wide cement storm drains that although are mostly covered with cement planks, also come with ample opportunity to fall in and realistically break something vital to further adventuring. 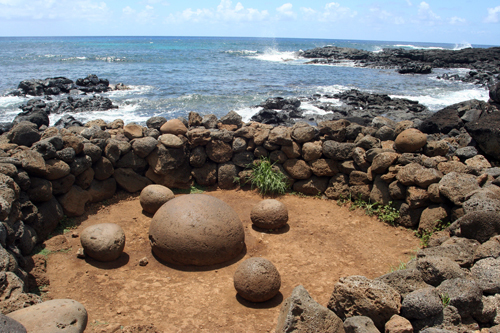 Welcome to Rapa Nui, wonder of the world, world heritage site, home to the Rapanui people. Please don’t break it. Thanks. 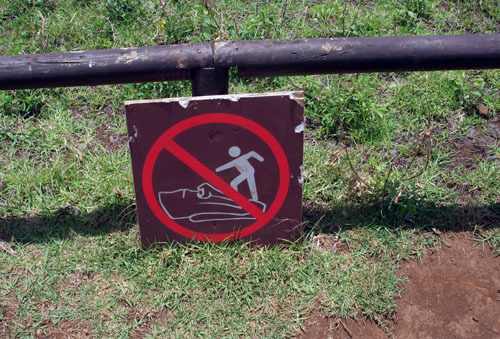 Hanga Roa is not a quick place to get acquainted with. But it is a welcoming place and survives mostly on tourism. Despite the constant stream of tourists, the city has a deep character that reflects the history and nobility of the Rapanui people who have earned the fascination of millions and held onto it for centuries. 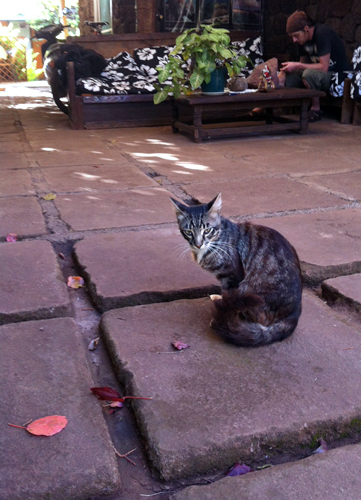 Our hostel kitty at the Kona Tau. interesting, im an islander myself, from another side of the world. Such stories are insightful, thank you.